So since this is the week of combining hobbies, how about a happy mix of anime/cats/crocheting? Yes, at my age I still regularly watch Japanese cartoons with a few friends, and since one of them moved recently, I thought I'd bring something handmade as a housewarming gift. Both anime lovers and non- are aware of the famous Hayao Miyazaki, who created Princess Mononoke and many other heart-warming animations. 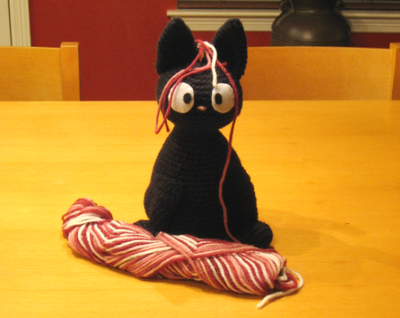 So here's my first attempt at crochet design to make Jiji the cat from his movie Kiki's Delivery Service! To download my free pattern, click this link from Ravelry. Enjoy! I checked it, and you should be able to get it if you sign up for a free account at Ravelry.com. If you still can't access it, please feel free to email me at gmail.com (username: agamerswife). My pleasure, can't wait to see the finished project! My name is marmottte, I've found your pattern for Jiji the cat on raverly, and I'm actually making it as this little cat looks just like my cat. Many friends of mine would like to make their own I guess, but as they don't speack english it is impossible for them. So I was wondering if you allow me to translate into French your model: I would be very happy if you do. Thank you for considering my request kindly and thank you again for this endearing creation. Fabulous pattern. Cute cat. Thanks for the free download. I loved it! i want to make this for my new grand son, how should i make the face baby safe? Sorry for the late reply! The way I made it (with felt eyes and a yarn nose), it's baby safe. As long as you don't sew any buttons or use safety eyes or any other small plastic item that can be chewed/pulled off, it should be safe. Thank you so much for the pattern! I have successfully made a GiGi with your pattern and have crocheted a red bow-tie and a fish for her. Thanks again for your hard work to write down the pattern and be generous enough to make it free! I love this! I named my cat Jiji after Kiki's Jiji..I can't wait to make one! :) Thanks for sharing! hi thank you so much for the cute pattern. I'm currently trying to make it but I have a question. In round 39 of the head/body it says to work in the back loops only. Do you only do this for that round or do u continue to do this for the rest of the body? I appreciate your help. @Sarah - Great question. You're correct; crochet through back loops only for that row. Then for the rest of the body, continue crocheting through both loops as normal. Good luck! Hey, this is my first time making something like this and my first attempt at making a Jiji is going to be for my boyfriend. He loves Miazakyi and he's already gotten a Totoro hat out of me, which is a serious labor of love. I'm so thrilled that this has been relatively easy to do, especially once I had my coworkers explain some of the terms to me. anyways, my question! After step 15 and 16, it says to stuff the head and continue. Am I supposed to sew up the head at all before I do so? Or will it just cinch itself? Since I've never done this I can't see exactly how it is going to turn out, just based on reading the pattern. Thanks! Nope! The head continues straight into the neck and body, so no need to close up the head. Good luck and hope your boyfriend enjoys the gift! @Stephanie - I think they just used my regular pattern, but maybe they crocheted it using thinner yarn and a smaller hook? That's a good idea though... I might consider making a smaller Jiji pattern in the future! Hello! I am fairly new at crocheting and would love to make Jiji(: but "chain two, working 8 into the first (or second) chain confuses me. Can you please help me? thanks for this beautiful pattern! I made Jiji as a present and they love it! @Hunter - Here's a more in-depth tutorial of what I mean by "Chain 2, work 8 sc into first chain." It's basically the magic loop technique. Hope this helps! or does it mean only do 63sc then move onto round 39? I'm glad I've found this. Thank you for making it free. I want to crochet a Jiji for cosplay. I have a question about the head. Mine seems like not turn out to look like a head. It looks like a UFO. Flat & not rounded. This is my 3rd attempt. Any advice? @Lala - I'm so sorry that it has been turning out that way! I would just add more rounds to the widest part of the head (maybe after Rnd 7 or 8) so that it's taller and less squat. If you find that the body is also too squat, you can also add more rounds after Rnd 38. Hope this helps and can't wait to see your cosplay!